For generations, hikers, naturalists, climbers, environmentalists, and visitors of all ages have come to Yosemite National Park to enjoy and reflect on one of nature’s true wonders. This little volume is the perfect companion for those moments of reflection. 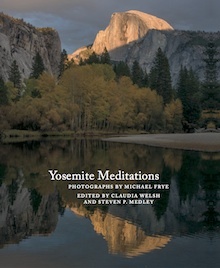 The insights of writers, scientists, poets, and leaders like Marcel Proust, Albert Einstein, Diane Ackerman, Gary Snyder, and Franklin D. Roosevelt are paired with gorgeous photographs, inviting a deeper understanding and connection to the earth, and to this magnificent park. This revised tenth anniversary edition includes favorite photographs and quotes from the first edition, plus many new ones.